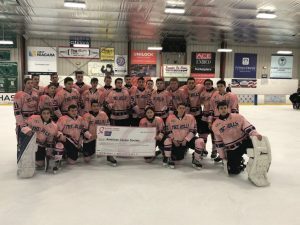 Armonk, New York — The Byram Hills Athletics Department is grateful to everyone who participated in the varsity ice hockey team’s seventh annual “Pink the Rink” game and fundraiser, which raised $13,817 for breast cancer research last week. Photo caption: The Byram Hills High School varsity ice hockey team at Friday night’s “Pink the Rink” hockey game and fundraiser. The team raised nearly $14,000 to fight breast cancer.